The Maltings, Ely, Cambs. UK. 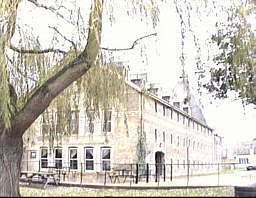 The Maltings, built in 1868, was converted into a public hall in 1971 and now has rooms available for hire, as well as being home to Ta Bouche Restaurant and Ely Cinema. In 1868 it was used for malting barley. High temperatures were used to cause the barley to sprout, before it could be taken to the brewery. Approach the river's edge near the bridge, and look over to the other side, still known as "Babylon" and owned privately. With your back to the river look to the buildings opposite; the house on the corner of the lane was once a house of correction for young ladies, called "The Haven". The oddly shaped little house to the left of the Ta Bouche Restaurant is the "Ladder House", so called because it housed the ladders for the nearby brewery and THE MALTINGS (21). The builder of the Maltings, Ebenezer Harlock, lived at the QUAY HOUSE (20), which is the Ta Bouche Restaurant now. The Maltings, built in 1868, was converted into a public hall in 1971 and now has rooms available for hire, as well as serving meals and drinks. In 1868 it was used for malting barley. High temperatures were used to cause the barley to sprout, before it could be taken to the brewery. Now walk along the riverside in front of the Maltings. The walk is known as Quai D'Orsay, and was named shortly after the twinning of East Cambridgeshire District with the town of Orsay in France, in 1980\81. The first boathouse you see on the opposite bank belongs to the King's School Ely, while the second one belongs to the University of Cambridge. The Cambridge crew practice here before the famous Boat Race each year.